Robot bartenders are serving up cocktails and shaking martinis on a tech-powered cruise ship called Quantum of the Seas. 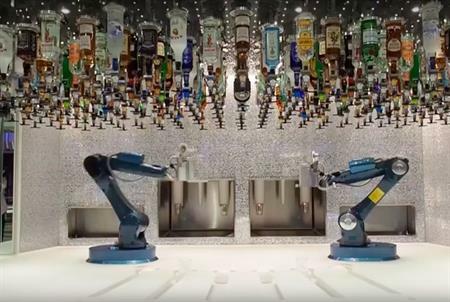 Owners of the Bionic Bar on Royal Caribbean's Quantum of the Seas have filmed their bartender robots during one of the performances during the cruise, with the droids twisting and turning as they serve drinks. Onboard the vessel, guest rooms are equipped with energy efficient and environmentally friendly lighting systems and "virtual balconies" that display real-time sights and sounds of the sea through 80-inch LED screens so that every stateroom has a "view".